A true Philly Cheese Steak of Hoagie isn't complete without a scoop of hot peppers. 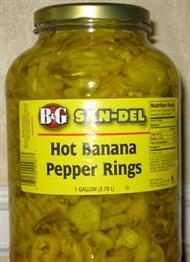 These hot banana peppers are medium in intensity and even the meek will enjoy a few to kick their sandwich up a notch. After opening, your gallon of peppers must be refrigerated.